Southern African focused exploration company Prospect Resources Limited (ASX: PSC) announced to the ASX today that it has completed rehabilitation and mine construction at its Prestwood Gold Mine. The work took longer than expected due to debris in the main shaft, old drives and stopes from the mine being closed for such a long period of time. There was also damage from artisanal miners. Mine development is being geared towards exploiting the high-grade intercepts defined by its 2014 maiden surface drilling programme. The 2014 maiden 6 hole, 1281 metre drill programme, confirmed that the mineralised reef continues below 4.5 level and along strike of the historic gold workings. Five of six holes drilled intersected intact Main Prestwood Reef down dip of existing workings to 195m below surface. The 2014 RC programme was successful in achieving its two main objectives. The first to prove the continuity of the historically mined Main Prestwood Reef, at economic grades along strike and down dip. The second to identify parallel zones of mineralisation, particularly at the greenstone-monzonite contact, that can be projected to near-surface, potential targets for open-pit operations. During the mine rehabilitation, it was discovered that old stoping was more extensive than historic reports suggested, with almost 50m of strike removed from 4 level all the way to just below the weathered zone, on half (‘subdrive’) level. Prospect Resources considers these findings a testament to the high grades of this deposit. Whilst production is behind schedule, shaft sinking from 4 level to 10 level on the sub-vertical shaft is progressing on schedule. Shaft sinking is expected to be continuous. The 5 level elevation has been reached and drives to the SW and NE are in progress targeting known high grade borehole intercepts (Yellow Zones). Isometric Geological Model, looking north northeast with the mineralised monzonite contact shown in blue. This zone is an immediate target for underground diamond drilling from 3 and 4 levels. PSC intends to continue to shaft sink to the 10 level and extend the drives north east and south west to develop further mining blocks after commencement of production on 5 level and then 6 level in the coming weeks. These two levels target known high grade zones greater than 9 grams per tonne of gold. To further boost its plans, PSC has toll treating access to both the Farvic Gold Mine and Reduction facility (5kms distance) and also the West Nicholson Gold Reduction Plant (25kms distance). This is complementary to the infrastructure development that has been completed on 3 and 4 levels to allow mining to begin. 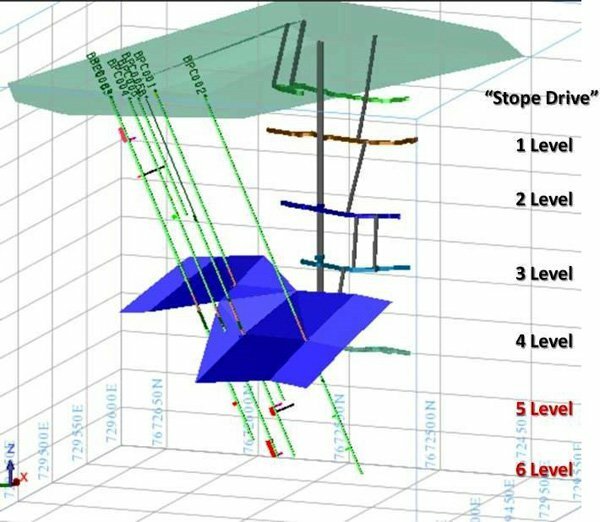 PSC estimates that tonnage available for stoping per level is of 3800 tonne at a head grade of 6.0 g/t and the initial mining rate is 40 tonne per day from this Prestwood main shaft. The company estimates a shaft hoist capacity of 100 tonnes per day and average monthly production of 190 oz. The Company plans to mine 3 levels per year from the Prestwood Main Shaft, with additional tonnage being brought online throughout 2016 and 2017 from the nearby Prestwood A, Bucks Reef and Sally mines. It is estimated that the known mines are likely to produce approximately 200 tonne per day by mid-2017. PSC believes it can fast track this production with additional working capital. 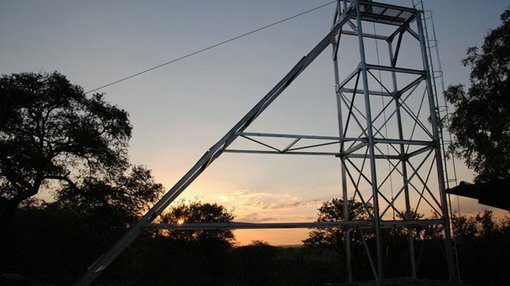 The historic Prestwood Gold Mine is located approximately 112km south east of Bulawayo in Zimbabwe, and historically produced approximately 499kg of gold (approx. 16,000oz) at 33.1g/t. It is situated within an almost contiguous block of claims covering approximately 25km2 of the gold bearing Gwanda Greenstone Belt. These claims cover more than nine historic gold mines. Prospect Resources is of the view that it is particularly prospective as it lies in the same geological setting as the nearby Farvic Gold Mine, located 4km to the east.